cost of doing business and decreases profits for the merchant. based bankcard processing at no cost to the merchant. for the cost of processing transactions so the merchant doesn't have to. 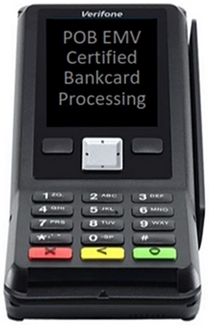 bankcard processing services, but without the expensive processing fees. Some pob service providers like to place free credit card terminals in merchant locations so they can make profit off of the merchant's customers. They do this by having a high surcharge and these providers share very little if anything with the merchant. This is not a good deal for the merchant because customers do not like to pay high surcharges which always causes merchants to lose some of their customers. Don't be fooled by offers for "free cashless atm machines" because they are taking money that your business should be making! If the merchant has a type of business where a higher surcharge can be supported, the merchant should be making the extra profit from their customers, not some fast talking sales person. These providers are taking advantage of merchants by claiming equipment is very expensive and costly to maintain and this is all rocket science which of course is not true. This is how many in sales today choose to do business... they don't share the whole story with their customers! Our business model is simple and straight forward with no hidden fees or agendas to inflate profits like those other providers. Our program offers low cost equipment and processing services, backed by industry leading tech support to keep things running as smooth as possible so merchants can focus on their customers and running their business. Even if you end up going with another provider, before you make a decision take advantage of our years of experience in the industry and contact us with any questions you may have to help you better understand the options that are available to you and how they may effect your business and your customers. It doesn't cost anything to talk a little shop! Click Here to request POB bankcard processing and equipment details to be sent to you buy email. Once you read through the information that is sent, you will have complete details to make an informed decision concerning the best options available for your business and how pob merchant services can help your business become more profitable. receive details sent by email.